For a few years during the "re-birth" of myself, I was very strict about eating carbs and fat. It wasn't an Atkins or South Beach Diet thing, I just restricted my daily intake of carbs, breads, potatoes, fried foods. Five years later, that's changed and while I'm not back to my old and fat bad ways, I do indulge, a bit more freely, in bread/cake and sometimes fried foods. I doubt I'll ever eat the way I did when I was in my 20's and 30's - or else I'll drop dead of a coronary, but I cannot see a life in which I don't get to enjoy some of the comfort foods of yor, like chicken and waffles. There is a way to enjoy this All-American classic combination and still have it be healthy. I haven't completely fallen off my two-wheeler here - believe me, you can make and eat a tasty version of home-made, made-from-scratch waffles and oven-fried chicken WITH GRAVY and not feel like Fatty Boombalaty. No tuba player will accompany your every step as your roll out with the barrels of fat around your middle, promise! With a few small tweaks, I reworked an otherwise verboten meal and made it wholesome using only real ingredients. As a testament to the meal, I even have photos of LeAnne from Tinsel and Tine enjoying her meal at my house, along with my sous chef and partner, Liz. No complaints from the tasting crew and we all went back for seconds...and thirds! The waffles were made with whole wheat flours, low-fat buttermilk and light butter. The chicken was oven-fried using whole wheat flour and bread crumbs, with a seasoning mixture that I concocted using garlic and onion powders, salt and pepper and paprika. Use whatever seasoning blend you like, but know that you need to season the flour and the breadcrumbs to make sure the chicken has FLAVOR! The gravy was made using light butter, the seasoned whole wheat flour from the chicken, and non-fat milk. Short of not eating, I don't know how you could make this comfort food any more virtuous. The waffle recipe is from Alton Brown - modified for my own use. I'm really into making waffles right now. 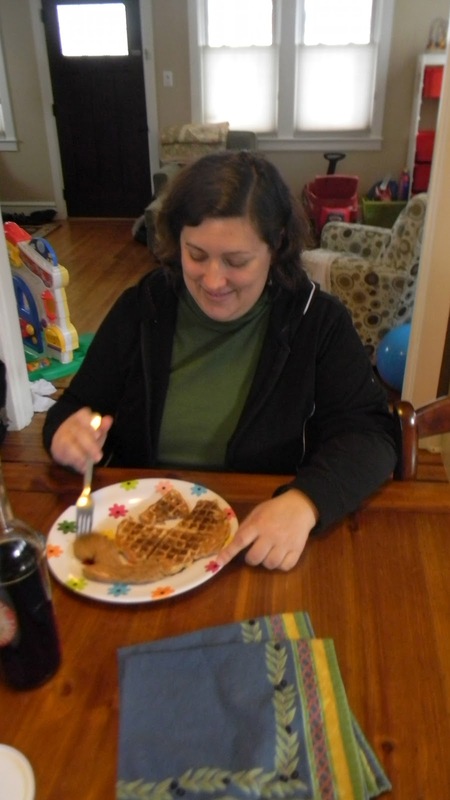 The Cuisinart Waffle Iron that I bought was the first "New-House" purchase I made once we moved to Collingswood. I had been wanting a waffle maker for years but hesitated, thinking I didn't need yet another one-note/one-use appliance to clutter up the counter or cabinets. As I have discovered, there are many uses for waffle irons that go way beyond making pancakes with some divots! I'll be experimenting with recipes and finds that I've read about on Waffleizer.com in future posts. I've been making waffles just about every weekend for the past few months. If I know in advance that I want to make them, I make the batter the night before, refrigerating it overnight. It actually makes better waffles; the batter develops, the flavor is more nuanced and the gluten in the flour has a chance to relax, making for a tender waffle. The first time I made these I didn't have buttermilk, and the waffles weren't that good. It's worth seeking out the buttermilk. Must be a South Jersey thing, but I've had no problem finding quarts of low-fat old-fashioned buttermilk in just about every grocery store in my area. If you can't find it, you can make it yourself! Here's a link to a recipe for 2 versions of home-made buttermilk(s). In one large mixing bowl, combine the dry ingredients, flour(s) though cinnamon (if using); dry whisk these ingredients together to incorporate. Set aside. In another large mixing bowl, beat the eggs and egg whites together until they are frothy then pour in the buttermilk, non-fat milk and melted and cooled light butter, whisking to combine. Pour the wet ingredients into the dry and fold until combined, but do not over-mix. There may be a few lumps but all the batter should be thoroughly mixed together. Let the batter sit for at least 5 minutes to rest, or cover and refrigerate overnight. Spray the waffle iron with the cooking spray before using or else the waffle batter won't release! Depending on the size of the waffle iron, ladle in 1/4 to 1/2 cup of waffle batter onto the iron; close the top and cook until the waffle is golden brown on both sides and the waffle releases easily. Serve immediately or keep warm in a 200 degree oven. Extra waffles, should you have any left-overs, will keep covered and refrigerated for up to 4 days, or will keep frozen for up to 1 month, tightly wrapped. Makes approximately 8 standard size (8-inch round) waffles. Preheat oven to 375 degrees. Line a sheet tray with either a Silpat, aluminum foil or parchment paper. Spray it liberally with cooking spray. Set aside. Set up a dredging station using 3 shallow plates/bowls. In one, whisk together the whole wheat flour with half of all the dry seasonings, garlic and onion powders, paprika, salt and black pepper. In the 2nd dish, whisk the egg and 1/4 cup of water together. In the third dish, mix together the whole wheat bread crumbs with the remaining dry seasonings. Take the chicken tenders and lightly coat/dredge them in the seasoned flour. Next dip the flour-coated chicken tenders in the egg wash (the flour helps the egg stick to the chicken,which will then allow the breadcrumbs stick to the chicken); last - dip the egg washed chicken tender into the seasoned bread crumbs, turning to coat evenly. Take the bread crumb coated chicken tenders and lay them out onto the prepared sheet tray. Continue to flour, egg wash and bread the chicken tenders until they are all done. Bake the chicken tenders for 15 minutes, turning them over once to brown both sides of the tenders. Chicken is done when they are golden brown and firm to the touch - about 15 minutes. For the gravy, use a small sauce pot and melt over medium-high heat, 1 tablespoon of light butter. Whisk in a tablespoon of the seasoned flour used to dredge the chicken tenders; cook the butter/flour mixture for 2 to 3 minutes, to cook off the floury taste. Carefully pour in 1 cup of non-fat milk, whisking constantly to avoid lumps. Bring the milk/flour mixture to almost a boil then reduce the heat to a simmer. Heat the milk, stirring constantly until the milk begins to thicken and coats the back of a spoon - about 5 minutes. Taste and adjust seasonings, adding more salt and pepper as needed and season with a pinch of fresh nutmeg. Serve the gravy hot with hot oven-fried chicken over the waffles! Now I'm starving and I just ate! I'll have to try this after I bring the waffle maker back from the shore. It was excellent! As were the hostesses and cute little host. If only Le Anne from Tinsel & Tine would eat a healthier alternative for every meal, but as you can see she does not. I have never heard of waffles and fried chicken with gravy before! I guess I need to go a little further south of the border!! Sounds divine!